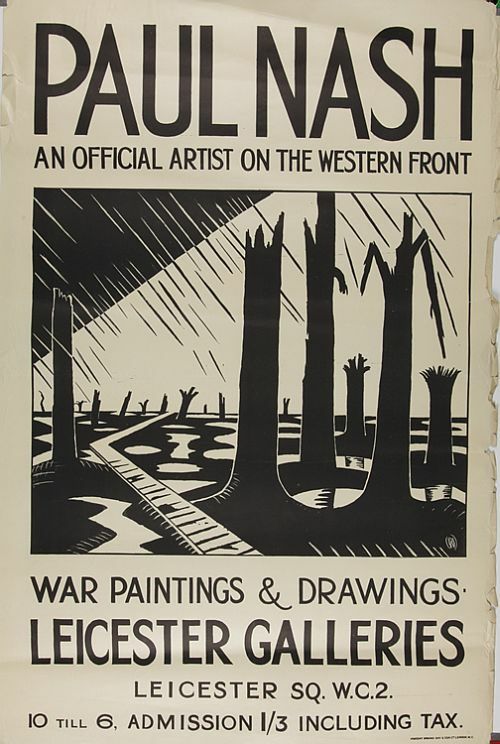 Paul Nash was 25 at the outbreak of the First World War. He would come to see himself as a messenger to those who wanted the war to go on for ever, creating some of the most devastating landscapes of war ever painted, his outrage at the waste of life expressed through his depiction of the violation of nature in landscapes that were both visionary and terrifyingly realistic. He had been a member of that remarkable pre-war cohort at the Slade School of Art that included Christopher Nevinson, Stanley Spencer, William Roberts, Ben Nicholson and Edward Wadsworth. 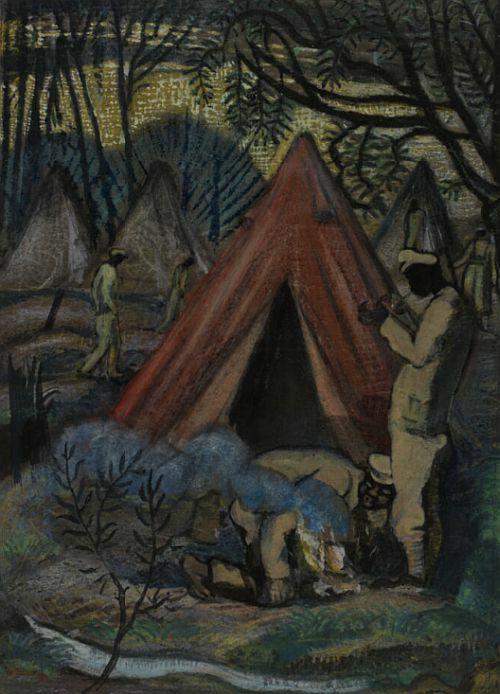 Nash had already gained a reputation as a painter of nocturnes and visionary landscapes when he reluctantly volunteered in September 1914, first joining the London Regiment (Artists’ Rifles) for home service only. But in February 1917, having completed officer training, he embarked for France, arriving in the Ypres Sector soon after. 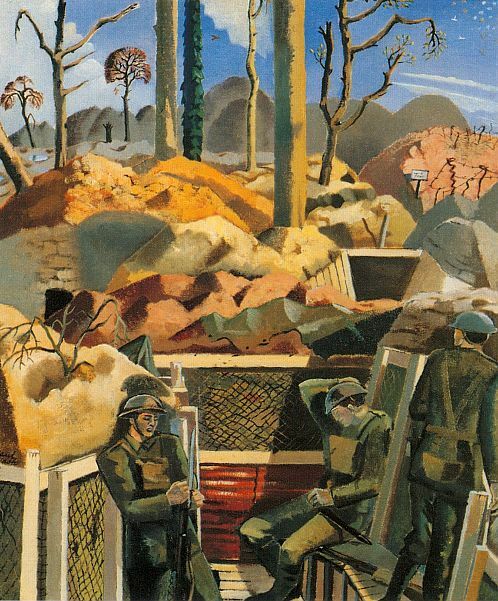 Along with Nevinson and Spencer, Paul Nash is the First World War artist whom I most admire, so I was interested in Paul Gough’s account of his war years in A Terrible Beauty: British Artists in the First World War which I finished reading recently. Twilight quivers above, shrinking into night, and a perfect crescent moon sits uncannily below pale stars. As the dark gathers, the horizon brightens and again vanishes as the Very lights rise and fall, shedding their weird greenish glare over the land. … At intervals we send up Very lights, and the ghastly face of No Man’s Land leaps up in the garish light , then, as the rocket falls, the great shadows flow back, shutting it into darkness again. … Maybe you can feel something of the weird beauty from this little letter. Linnets and chaffinches sing in waste trenched ground with trees and water tanks between us and Arras. Magpies over No Man’s Land in pairs. Imagine a wide landscape flat and scantily wooded and what trees remain blasted and torn, naked and scarred and riddled. The ground for miles around furrowed into trenches, pitted with yawning holes in which the water lies still and cold or heaped with mounds of earth, tangles of rusty wire, tin plates, stakes, sandbags and all the refuse of war… In the midst of this strange country… men are living in their narrow ditches. After only three months at the front Nash was injured after falling into a trench and invalided back to England. Convalescing at home a week later, Nash learned that his division had been virtually annihilated – with most of his fellow-officers killed – in an attack on the infamous Hill 60 that presaged the Messines Ridge offensive. I realise no one in England knows what the scene of the war is like. They cannot imagine the daily and nightly background of the fighter. If I can, I will show them…. I have just returned, last night, from a visit to Brigade Headquarters up the line and I shall not forget it as long as I live. I have seen the most frightful nightmare of a country more conceived by Dante or Poe than by nature, unspeakable, utterly indescribable. In the fifteen drawings I have made I may give you some idea of its horror, but only being in it and of it can ever make you sensible of its dreadful nature and of what our men in France have to face. We all have a vague notion of the terrors of a battle, and can conjure up with the aid of some of the more inspired war correspondents and the pictures in the Daily Mirror some vision of battlefield; but no pen or drawing can convey this country – the normal setting of the battles taking place, day and night, month after month. Evil and the incarnate fiend alone can be master of this war, no glimmer of God’s hand is seen anywhere. Sunset and sunrise are blasphemous, they are mockeries to man, only the black rain out of the bruised and swollen clouds all through the bitter black of night is fit atmosphere in such a land. The rain drives on, the stinking mud becomes more evilly yellow, the shell holes fill up with green-white water, the roads and tracks are covered in inches of slime, the black dying trees ooze and sweat and the shells never cease. They alone plunge overhead, tearing away the rotting tree stumps, breaking the plank roads, striking down horses and mules, annihilating, maiming, maddening, they plunge into the grave that is this land; one huge grave, and cast up on it the poor dead. It is unspeakable, godless, hopeless. I am no longer an artist interested and curious, I am a messenger who will bring back word from the men who are fighting to those who want the war to go on for ever. Feeble, inarticulate, will be my message, but it will have a bitter truth, and may it burn their lousy souls. 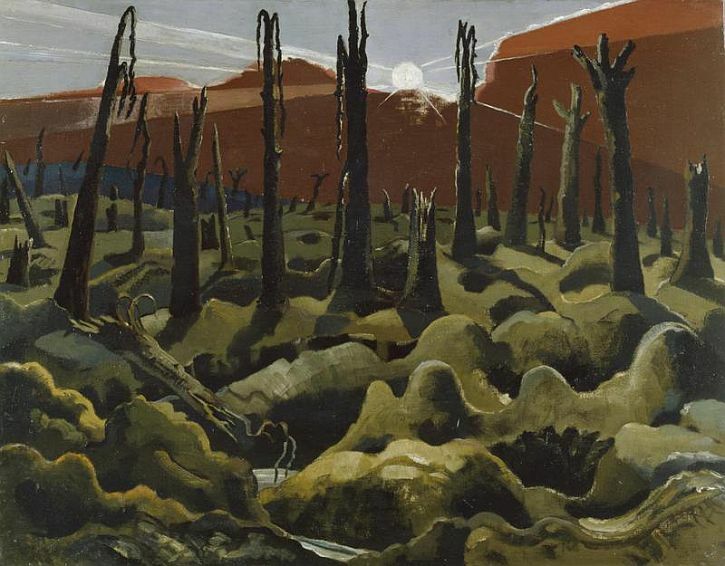 As the messenger, Paul Nash created some of the most devastating landscapes of war ever painted, his outrage at the waste of life was expressed through his depiction of the violation of nature in landscapes that were both visionary and terrifyingly realistic. In a perceptive opening to his chapter on Nash, Paul Gough observes that ‘of all British artists of the last century, Paul Nash is perhaps the one most readily associated with the sanctity and loveliness of trees’. As a visionary painter, Nash sensed the metaphysical power of trees – how they ‘linked the underworld, the earth’s surface and the skies’. Nash was sensitive, not only to the human carnage he witnessed, but also to the devastation of the verdant plains of Flanders, Artois and Picardy, where trees had offered ‘vantage and protection, raw materials and nourishment’, in thick forests and neat copses. He was aghast at the sight of splintered copses and dismembered trees, seeing in their shattered limbs an equivalent for the human carnage that lay all around or even hung in shreds from the eviscerated treetops. In so many of his war pictures, the trees remain inert and gaunt, failing to respond to the shafts of sunlight; their branches dangle lifelessly ‘like melancholy tresses of hair’, mourning the death of the world and its values that Nash held so dear’. The drawings he made then, of shorn trees in ruined and flooded landscapes, were the works that made Nash’s reputation. They were shown at the Leicester Galleries in 1918 together with his first efforts at oil painting, in which he was self-taught and quickly successful, though his drawings made in the field had more immediate public impact. His poetic imagination, instead of being crushed by the terrible circumstances of war, had expanded to produce terrible images – terrible because of their combination of detached, almost abstract, appreciation and their truth to appearance. His drawings are scored and scratched with uncompromising diagonals, the incessant rain is engraved in stabbing lines across the surface, the ashen wastes of the battlefield are dense with impenetrable strokes of his pen. 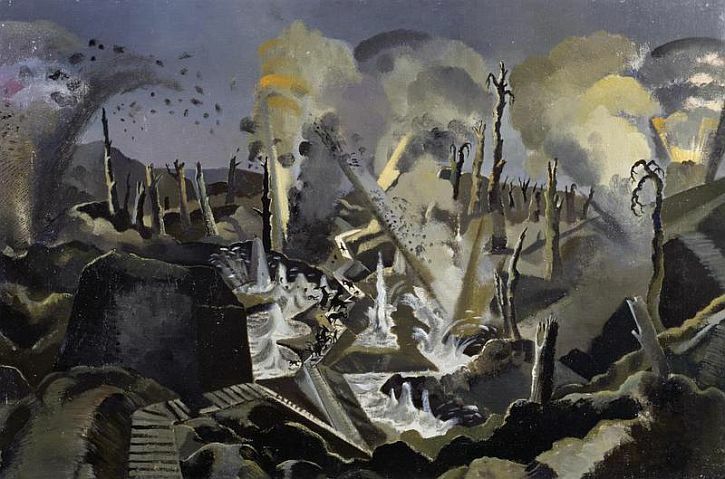 […] Nash had created a distinctive vision of war, one that brought new insights into the way that artists could depict the absences, the emptiness, the abraded surfaces, and the defiled hollows that were the essence of the Western Front. 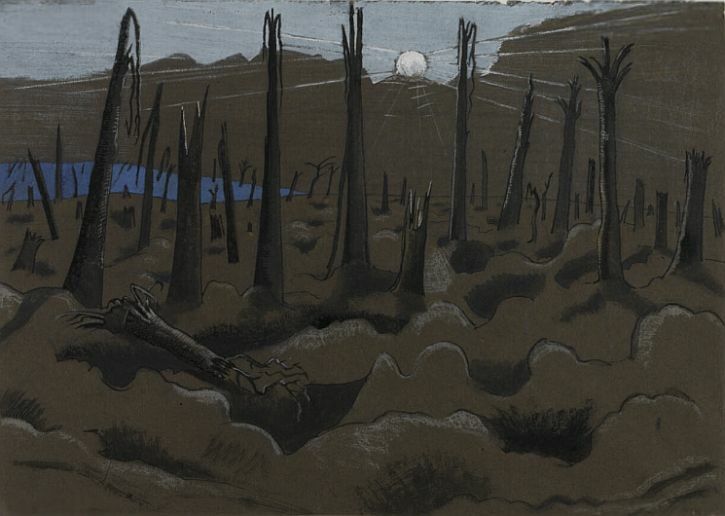 In May 1918 The Void of War, an exhibition of pictures by Paul Nash, opened in London. The most acclaimed work in the exhibition was the heavily ironic We Are Making a New World (above), ‘a brazenly symbolic canvas developed from a drawing of a sunrise at Inverness Copse, a derelict woodland deep in the Ypres Salient’. 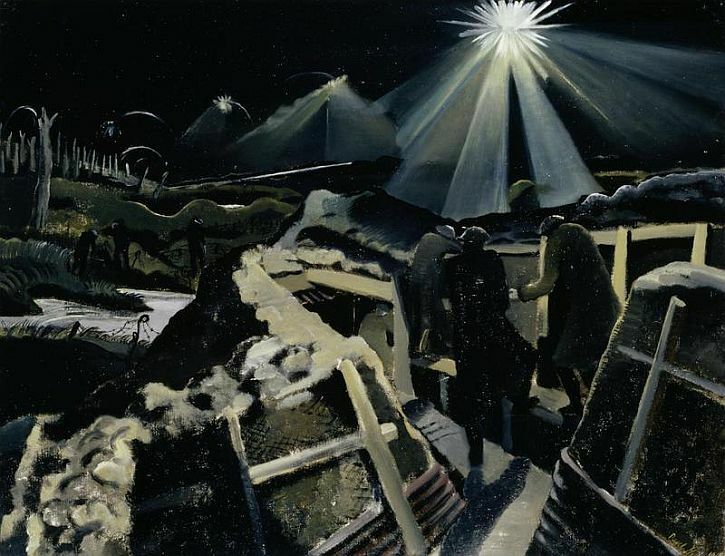 The painting has become one of the most memorable images of the First World War, the title mocking the ambitions of the war, as the sun rises on a scene of the total desolation. 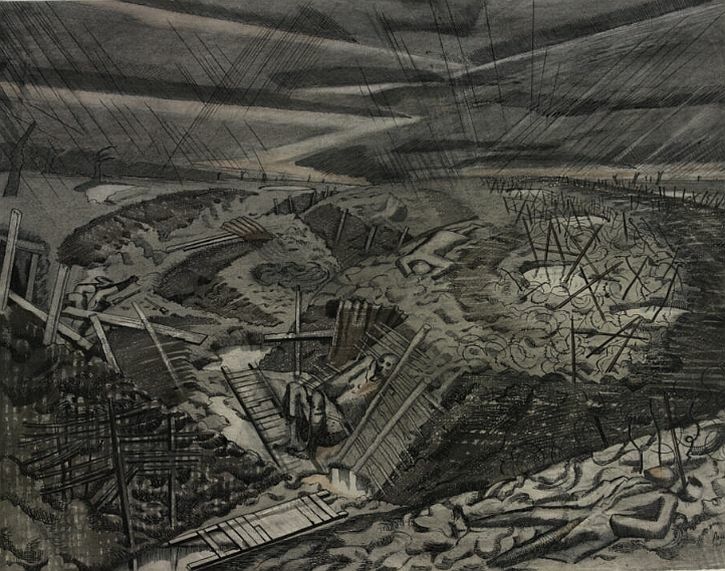 In these key drawings and paintings, Nash was beginning to work out a means of portraying the battlefield in concrete terms. His use of colour had become more ambitious, and in Void, one of the most powerful paintings exhibited in London, acidic colours depict the total devastation of war in a shocking, hellish scene that, far from commemorating valour, rather reveals the desolation, destruction, and terror of war. The Ypres Salient at Night shows three soldiers on the fire step of a trench surprised by a brilliant star shell lighting up the view over the battlefield. The painting shows us a fragmented world of chaos, where the demarcation of day and night, order and disorder, no longer exists as bombing continues throughout the night. In The Mule Track, Nash presents the viewer with another terrifying scene. Amidst the chaos of a heavy bombardment the small figures of a mule train are trying to cross the battlefield. They are reduced to defenceless puppets at the mercy of terrible forces. The animals rear and panic at nearby explosions, as the water in the flooded trenches wells up like geysers and rubble is thrown high into a sky obscured by large clouds of yellow and grey smoke. 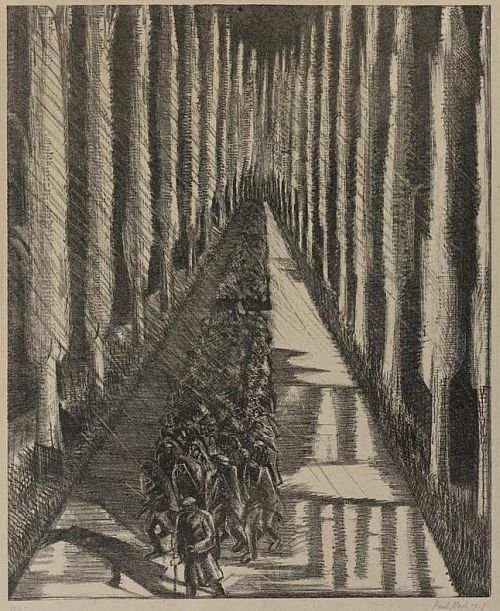 In a very fine drawing from this period, Nash shows a view along a straight road lined with tall trees that loom over a column of British soldiers marching down the road. The rain drives across the composition from the left, and the soldiers huddle beneath cloaks whilst marching. 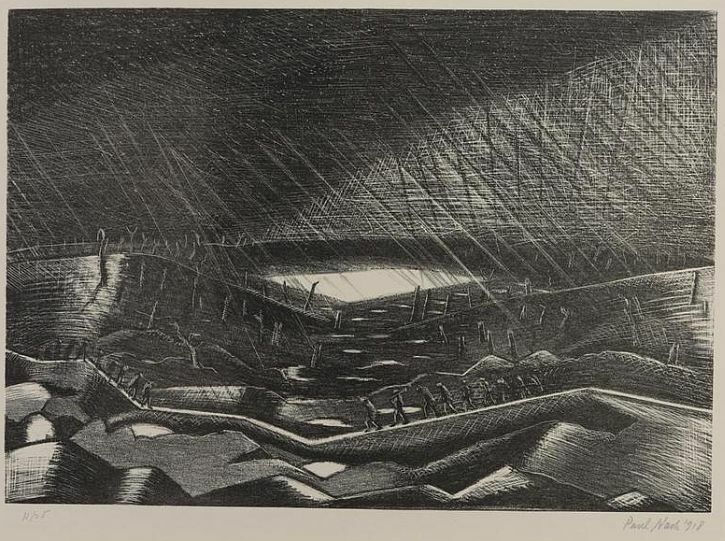 There are echoes in this work of CRW Nevinson’s handling of a similar subject matter in his war work, Column on the March from 1914 (see my earlier post). 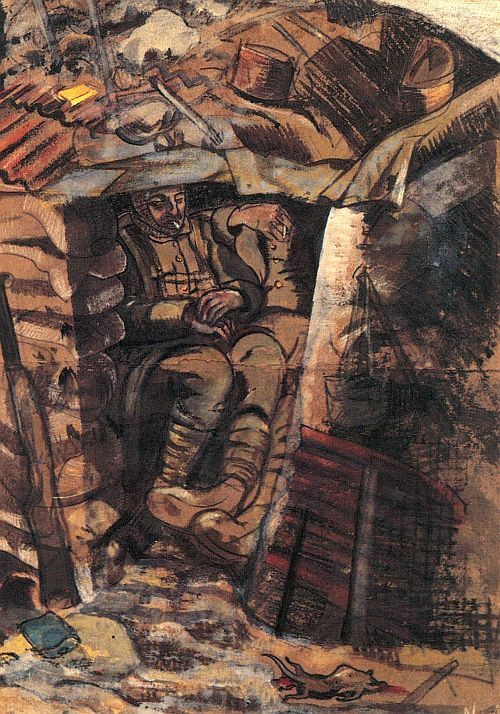 Nash certainly admired Nevinson, and recorded in a letter in July 1917 that they had just met. Great bomb craters filled with sullen waters, possibly concealing rotten corpses; the pitiful paths up and down dunes that speak of some hidden human presence; the pall of smoke partly filling the sky; the imagined stench. We assume that it is winter from the degraded palette, but it could just be the winter of the soul – war allows no other season than that of desolation. What makes this painful watercolour so memorable is the blasted tree, a great ripped phallic symbol enmeshed with barbed wire. There is a long tradition in Western landscape art of decaying tree stumps as symbols of destroyed civilisations. In sixteenth and seventeenth-century landscapes such signs of decay signify renewal, but in this modern work about the horrors of war, rebirth has been suspended. 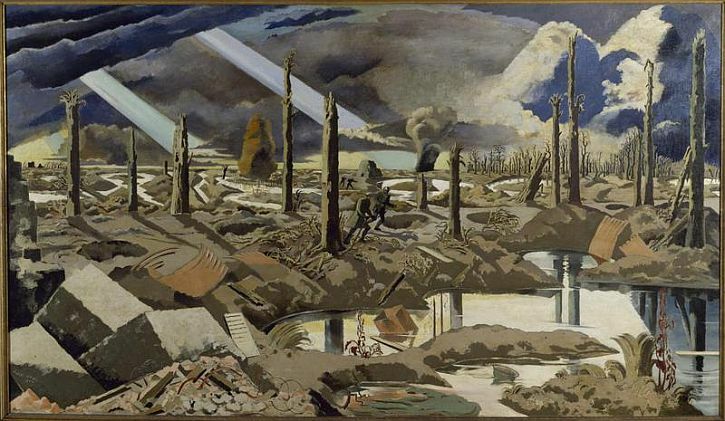 A month before the London exhibition opened, Nash had been commissioned by the Ministry of Information to make a large oil painting – originally to have been called A Flanders Battlefield – that was to feature in the planned Hall of Remembrance, alongside paintings by William Orpen and John Singer Sargent. The intention was that both the art and the setting would celebrate national ideals of heroism and sacrifice. However, the Hall of Remembrance was never built and the artists’ work ended up with the Imperial War Museum. By subtly dividing the canvas into three broad bands – a deep foreground of water-filled craters, the lateral axis of the road in the middle band, and the shattered landscape in the distance – [Nash] drew out the different directional properties in each of the three zones without losing either the phantasmagoric properties of the emptied landscape, nor the nullity of a place that had been relentlessly stripped of its former identity. 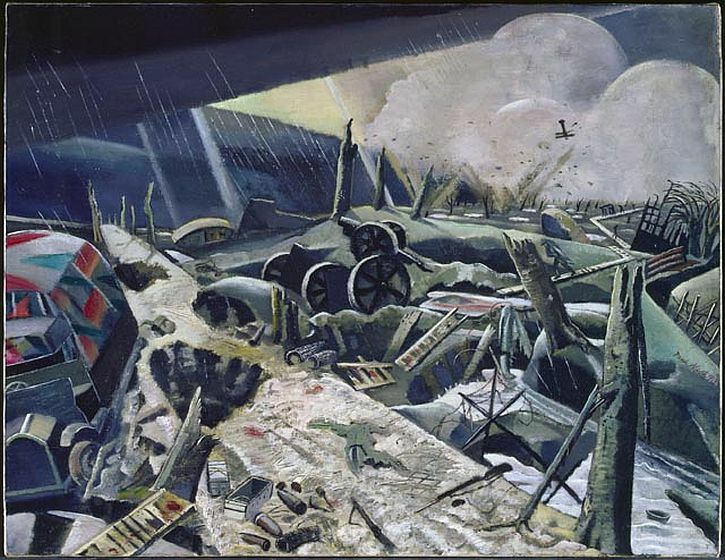 As so often in Nash’s war work, the foreground is crammed with insurmountable obstacles – pools of water that cannot easily be crossed, pyramidal blocks that bar the way into the interior space of the painting, piles of debris that clutter the ground plane. The viewer, writes Gough, seeks a way through the obstructions ‘into the distance where the ‘Promised Land’ of the horizon is unreachable, locked in some unimaginable future’. Nash considered The Menin Road to be the best thing he had ever done. ‘He was right’, argues Gough, concluding that Nash had emerged from the war as by far the most important and original young artist in Britain (he was just 28 at the war’s end). Ahead, wrote Nash in 1919, lay the ‘struggles of a war artist without a war’. He could not have known then that in another 20 years he would, once again, be appointed an official war artist. The Stuart Hall Project: who are we, what are we and what could we become? 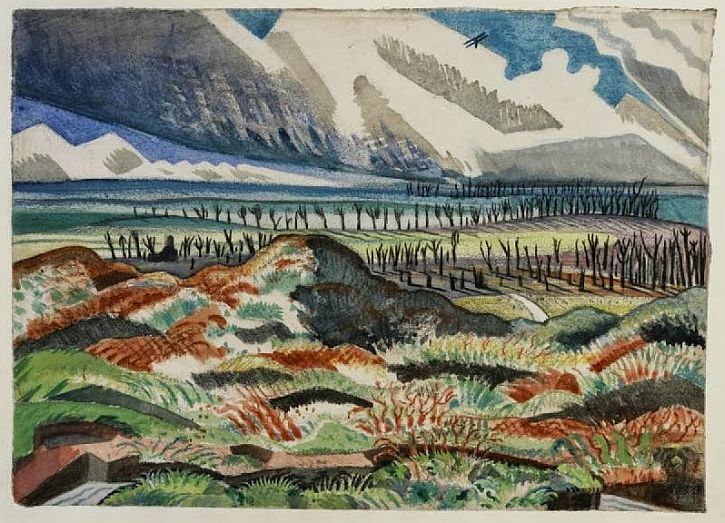 Continuing on from his first post about WW1 artists, Gerry Cordon now writes about Paul Nash. His pictures tell a true story in a raw and yet poetic style. There is real emotion and violence, with out the patronizing sentiment. I have felt for years he deserved a higher status than he seems to often have. Andy. My research often leads to your blogs. Another gem. Thank you. Thanks, Susan, comments like yours make blogging worthwhile! Wow, this is a great post, Gerry. 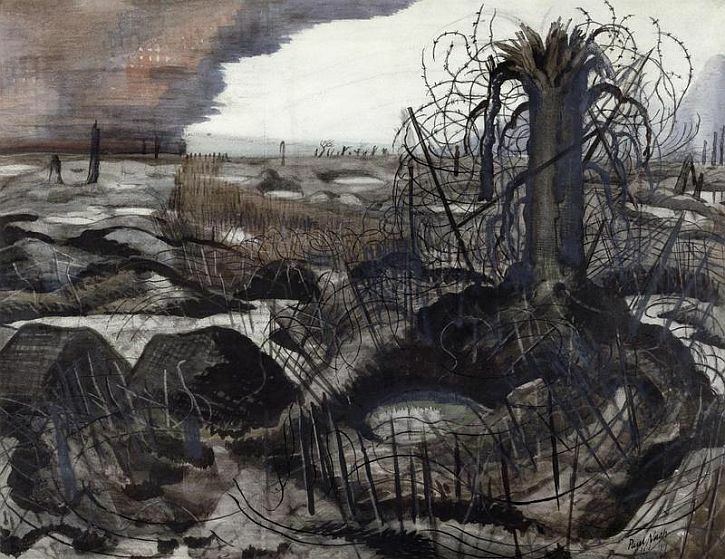 I’m a big fan of Wilfred Owen war poetry, myself, and I didn’t really know Paul Nash’s work. I went to the Paul Nash show at the Dulwich Picture Gallery in London. Brooding intense work!http://www.dulwichpicturegallery.org.uk/about/exhibitions-archive/modern-british/2010-paul-nash/ But your blog captures some of my favorites. Thankyou. This is a great article, very informative. Thank you for writing it! This is an extraordinary piece. You’ve written it beautifully thank you. I’d heard of Nash’s war paintings but never bothered to look them up, what a mistake, they are more striking and moving than I could have imagined.